President Nicolas Maduro said the new higher-denomination bills to replace the 100-Bolivar notes were ready, but they were still nowhere to be seen. CARACAS – Venezuela’s President Nicolas Maduro has delayed the withdrawal of the 100 bolivar bill until January amid protests, looting and economic chaos. Last Sunday, Maduro made the surprise announcement that the 100 bolivar note, which is worth about two US cents, would go out of circulation to be replaced by higher denomination bills. Venezuelans lined up to exchange 100-unit banknotes before they became worthless, but replacement bills failed to materialize, increasing the cash chaos in the country with the world’s highest inflation. On Thursday, Maduro said the new higher-denomination bills were ready, but they were still nowhere to be seen, and by Friday the country was largely devoid of any viable paper currency. Shopkeepers put up signs saying 100 bolivar bills would no longer be accepted. That meant many people looking to buy food or other essentials were out of luck, as banks had run out of lower denomination bills such as 50 and 20 bolivar notes during the week. In Caracas, consumers had to rely on credit cards and bank transfers or avoid making purchases altogether. Anger over the chaos led to skirmishes in six cities on Friday, the Associated Press reported. It said 32 people were taken into custody and one person was injured. In Caracas, protesters waved their 100 bolivar bills in the air and chanted “they’re useless!” and then fled as police in riot gear fired tear gas. Other enraged citizens have been publicly burning 100 bolivar bills during the demonstrations. As the anger escalated, Venezuelans looted delivery trucks and supermarkets and clashed with police. In the eastern city of Puerto la Cruz, “people rioted because they wanted to take out money and they weren’t allowed to,” a local baker told the AFP news agency. By yesterday, the army was called out to quell disturbances in several areas. Maduro claimed his country had been the victim of “international sabotage”, which had prevented new 500 bolivar currency notes arriving in time. 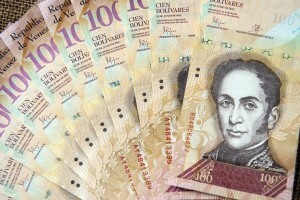 Caracas had said that the scrapping of the 100 bolivar note was necessary to prevent smuggling. He has said the gangs hold more than 300 billion bolivars worth of currency, most of it in 100-bolivar notes. The president said one reason for withdrawing the banknotes was to block any of the 100 bolivar notes from being taken back into Venezuela, where they would be worthless.